Troy is almost three hundred pounds, a sweaty, self-conscious ball of angst and nerves, in a uniform of bland tan pants. He’s standing on the metro platform, working up the nerve to kill himself, when Curt intervenes. Curt MacCrae, a filthy, emaciated, sometimes-student at Troy’s school, a homeless genius and guitar legend-that Curt. Curt convinces Troy not to jump, and then decides Troy owes him lunch. Thus begins the unlikeliest of friendships. Manic Curt gulps every pill he can find, steals everything that isn’t tied down, and is constantly starving and filthy. Troy is huge and unhappy, wallowing in his own self-hatred, convinced that everyone in the world is staring at him in disgust. He feels like he can’t live up to his perfect younger brother’s image, or his rigid military father’s expectations. However, the two of them form a relationship based on music. When Curt appoints Troy as the drummer in his band, Troy has five weeks to learn to play the drums like a madman, and he’s his own worst enemy. He just has trouble letting go of himself long enough to let the music creep out: he’s too focused on needing to be invisible for the music to work. But Curt’s belief in his abilities bolsters him, and transforms him from sweaty Troy to punk rocker Big T.
I was astonished when I flipped to the end of this book and discovered that it was written by a woman, especially because Troy’s voice came off as so authentically fat teenaged-boyish. She does an incredible job getting inside Troy’s head, and crafting these three-dimensional characters. That was my favorite part of this story: Curt is so frustratingly unreliable, and Troy so self-sabotaging. In short, they are so real, acting and behaving just like real people do. I was a little worried when I got into this novel that it would be one of those sappy Cinderella stories, where the fat kid loses weight, the homeless kids gets a bath and a job, and everyone lives happily ever after because now they’ve been transformed into Nice and Normal People. I hate when that happens, because the underlying message is: you can only be happy if you’re not yourself. 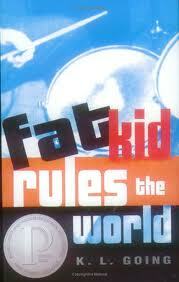 That is the beauty of Fat Kid Rules the World. Troy doesn’t lose weight. He doesn’t stop sweating. And by the end of the book, he’s still in his uniform of bland tan pants. The only change comes from his own self-acceptance. Thank you, thank you, thank you, P. L. Going, for not giving in to the conformity principle. Thanks for not letting your readers down! This is an amazing book. It totally inspired me to put on some Iggy Pop and stop believing that everyone is always staring at me. Going, K. L. Fat Kid Rules the World. Speak Books: New York, 2003. 185 pp. Posted on June 5, 2011 July 19, 2011 by ShannaPosted in ALA/YALSA Best Fiction for Young Adults, Printz Honor Book, Realistic Fiction, YA LitTagged drums, guitars, music, obesity, punk, rock, unlikely friendship. Next Next post: Julie Anne Peters is Coming!